It’s time for the weekly Winter Eat Local posting, a Sunday night thing. Yes, today it’s Easter and I was off to my brother’s house to eat traditional foods, but I did take local Virginia wine down there to share with the family. 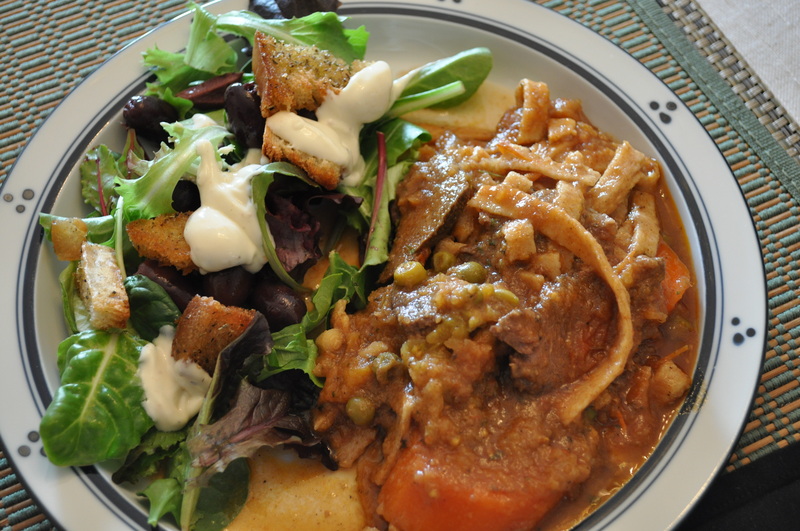 As for my weekly local meal, it was last night, and another crock pot meal using some of the venison in the freezer. The reason I am calling this post, mixing it up, is because I mixed all sorts of items to make this meal. It tasted great, just had weird combinations. And, was a mix of local fresh, local frozen, and organic canned items. Basically, a salad and a stew. The stew, made with venison rump roast, spent all day getting tender in the crock pot. I started with the roast placed on top of one of those huge carrots from the CSA, two of the parsnips, and an onion, again Breezy Willow CSA veggies. Then, the weird part, one pint jar of a root veggie puree made with last fall’s CSA, and taken from the freezer. This gave substance and thickness to the stew. One pint jar of heirloom Amana orange tomatoes from the freezer. Home grown tomatoes, blanched and frozen. Some frozen organic peas from last year. Two tablespoons of tomato paste. A bunch of dried herbs and spices, like cinnamon, garlic powder, cumin, paprika, parsley and oregano. Salt and pepper, too. All plopped in that pot for six hours on high. Oh, almost forgot, for the last hour, add a splash of chicken stock and some whole wheat egg noodles. Mine were picked up at Breezy Willow. They sell them at their farm store. Really good noodles. It came out tender and juicy and full of flavor. Paired with it was a very simple salad. I made the croutons Saturday morning with the last of the Great Harvest old fashioned white bread. The greens were CSA greens. Olives from Wegmans. Dressing from Roots. Neither of those were local. Still, this salad is so satisfying. Almost stole the show from the venison but not quite. 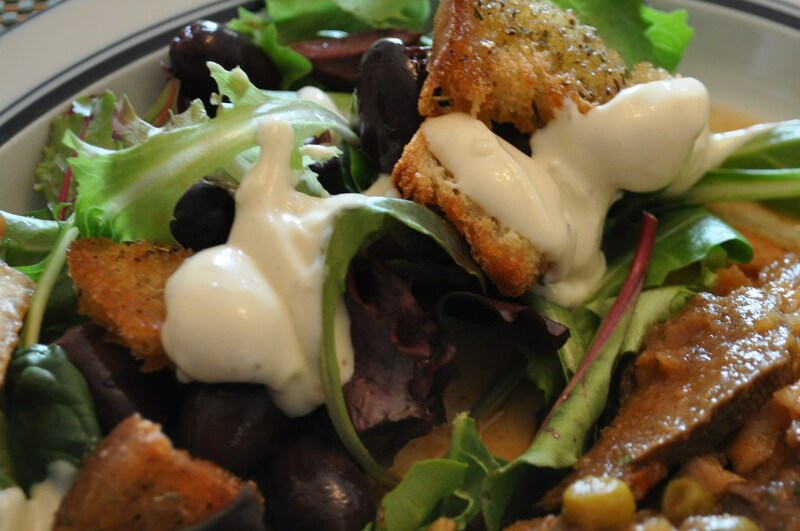 The croutons are really easy to make. I used one of my spice mixes, and some St. Helena Napa Valley grapeseed oil. A neutral oil, great for making dressings. I buy it by the 1/2 gallon. Mix bread cubes with the oil and spices, and a little salt. Put into a hot oven for five or six minutes. I used 400 degrees on the convection setting. Careful not to burn them, but get them dry and crunchy. I now have enough for a half dozen salads for the two of us. The wine. 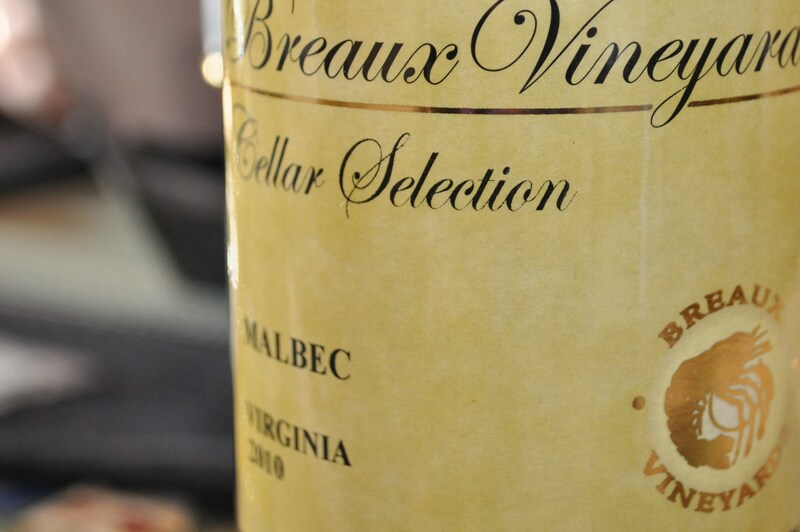 An excellent pairing with venison, a cellar selection Malbec from Breaux in Virginia. 2010 vintage. Just the right touch of weight to compliment the venison. By the way, you could cut the venison with a fork, it was so tender. And, cinnamon and garlic powder. A spice combo that is a winning one. VA Malbec and MD venison. Nice dinner, and still enough left for another dinner this week. That’s why I love my crock pot. Easy to use. Makes enough for multiple meals. Posted in CSA, Food, Local Businesses, Locavore, Wine, Winter Eat Local and tagged cooking, crock pot cooking, CSA, Food, heirloom tomatoes, local businesses, Locavore, wine. Bookmark the permalink. You always do interesting things with venison. I think I need to meet myself a hunter. Never thought I would get into venison like we have. We are lucky to have two friends who bow hunt, and a very large farm across the way where they have deer stands. Keeps the herds healthier when they aren’t starving and competing for food sources. What a great idea to put up root purees. I froze both roasted winter squashes and grilled summer veggies (separately) but I think it’s inspired to do a puree. In addition to your use of thickening, I think it’d make a great muffin flavor.